Blog | Responsible Garage Door Technicians: What Do They Check? Garage doors need to be handled by professionals because of their complexity and it may also cause harm if not handled properly. Many of the accidents are caused by garage door malfunction and improper repair by homeowners. When you have problems with your doors, we at garage door repair Atlanta advise homeowners to contact us for professional help. 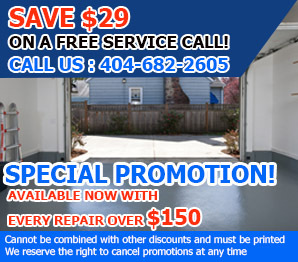 Technicians are well-trained and very experienced when it comes to garage door repair and replacement of broken parts. They follow a specific process when doing inspection and this helps them to diagnose the problem and quickly deliver the best solution. They come equipped with knowledge and a set of tools needed to complete their service. After explaining to them the situation or status of your door, they already know which part to check. Most commonly checked parts are the garage door springs, hinges, cables, tracks, weather-stripping, motors, and the electric wirings. They also check the openers, their sensors and remote controls if you have those installed. Responsible technicians have spare parts available when they arrive so they can replace the broken ones if required. As a homeowner, you must check some things before actually calling a technician in order to know if there is really something wrong with the garage door. If it is not opening or closing, you need to check the batteries of your remote control because it might just be the reason. You may also want to inspect the electronic eyes of sensors since it affects the door’s mechanism if misaligned. If your garage is opening but not closing, you may want to check if there are obstructions under the door. If the safety mechanism is working properly then an obstruction could be a reason. You can also check visible parts like cables and garage door tracks and if some are obviously broken, get our professional to handle it.